Chord Mojo helps turn your smartphone into a high-res music player | What Hi-Fi? Compact, portable headphone amplifier and DAC is designed to deliver music at up to studio-master-tape quality. 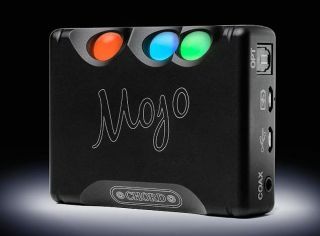 Chord Electronic's five-star, Award-winning Hugo DAC/amp now has a baby brother in the form of the £399 Mojo (the name is based on a contraction of the word's 'mobile joy' apparently). Packed inside its distinctive matt black aluminium casework is all manner of technology, based on the bigger Hugo's platform. Mojo connects to smartphones and portable players via one of three high-resolution digital inputs: microUSB, optical and a 3.5mm coaxial input. "Low-cost, widely available apps - such as Onkyo's HF player for iOS and Android - now make high-res music playback easy on a wide range of smartphones," says Chord. It's with that in mind that it has developed the ultra-compact Mojo. The device measures 22x60x82mm (HWD), weighs 180g and has a claimed battery life of ten hours. Chord says a full recharge via the microUSB connection takes just four hours thanks to the use of new high-temperature battery technology. There's extensive format support, including PCM, WAV, AAC, AIFF, MP3 and FLAC. Mojo will also handle DSD 64, DSD 128 and DSD 256. What's more, the optical input can handle audio up to 192kHz, while the microUSB and RCA mini jack operate up to 768kHz. Input selection is automatic: if more than one input is active, they are prioritised as USB first, coaxial second and optical third. Chord has taken pains to make the device easy to use, with minimal switches and controls. There are spherical buttons for powering it on and off, volume control and audio frequency information. The power button illuminates in different colours depending on the type of audio file being played: red for CD-quality (44.1kHz), orange for 48kHz, green for 96kHz and so on, up to bright white for DSD. In addition, there are two 3.5mm headphone jacks and charging is via microUSB. The latter has a battery status and charging indicator. As for performance, Chord claims an output of 35mW into 600 ohms, rising to 720mW into 8 ohms. Inside Chord uses a new Artix-7 FPGA chipset from Xilinx which has been customised by its own engineers, rather than relying on an off-the-shelf chip. "The Mojo distils 27 years of high-performance audio know-how into a single device designed to empower the smartphone," says Chord. "It uses the most advanced conversion technology available, to deliver genuinely unrivalled sound quality to up to two pairs of headphones." We've already had the Mojo in for extensive testing, and you can read our full review by clicking on the link below.